Just earlier today, Sandy was saying she wished I wrote for an ice cream blog, like say On Second Scoop, just so we could have a valid excuse to have a neverending stockpile of ice cream on hand. Me? 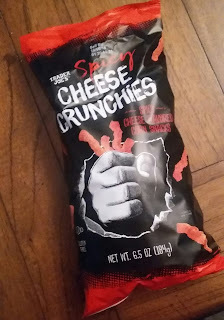 I sure am happy for our little TJ's blog, because without it, I'd never have a great reason to pick up a sack of Trader Joe's Spicy Cheese Crunchies. Nope, because if I never bought them, I'd never get the sneaking suspicion that were a lot like a more famous brand, like say Flamin' Hot Cheetos, but would be unsure as to the exact differences, and so purely in the best interests of my audience would also have to get those Flamin' Hots for direct comparision's sake. You know, for entertainment and science, and not just to mindlessly eat spicy cornmeal nuggets because yummmm. See the pic here. I'm sorry, it's a sucky one, because I took it with my potato phone. On the left is the aforementioned FHC's, on the right is the newcomer TJ's. Visibly, they're different - the Flamers are decidedly more red and fierce looking. Must be all those artifical colors noticeably absent from the Trader Joe's spicy crunchers...score one for TJ's. Once popped in the ol' snack hole, there's a few other fairly small differences. The spicy cheese crunchers from TJ's are a tad bit drier, it seems, from their Cheetos counterparts. There's a smidge less grease to them. This leads me to believe that the TJ's brand is baked as opposed to fried like Cheetos, and seeing that TJ's has 40 less calories and 5 grams less fat per identical 28 gram serving, I may be on to something. But really, taste. That's what it all comes down to. Which one's better? It's...tough to say. 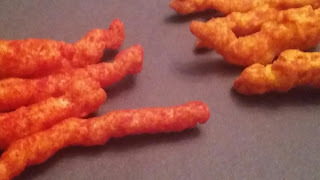 The Cheetos seem more focused on vibrant spice and heat (if not a little on the vinegary side) whereas the TJ's is...different. Maybe slightly more cheesy. Maybe slightly less hot and more range of flavor (like garlic, turmeric, etc). Maybe, as Sandy said, more of a "tomatoey" flavor, by which neither one of us is precisely sure what she means, but there's something to it. In all, it's kinda subtle. My three year old loves the TJ's spicy cheese crunchers. She'd melt after one Flamin' Hot Cheeto. So, there's that. Anyways, if totally junky kinda grub like this is your kinda thing, grab a bag of the TJ's crunchies for only a couple bucks. I wouldn't proclaim them as "healhty" but they are "healthier" than the competition, and are of approximate quality. Admittedly and somewhat ashamedly I kinda like them both...slight edge to TJ's. Thanks for allowing me to eat these, my adoring fans! Nice comparison!! I bet TJs are baked just because the not spicy version is baked and nutritional info is almost exact same. I’m impressed your three year old liked them! Makes me feel extra wimpy (which i am), so i’ll take a hard pass on these for myself but probably pick them up for a summer potluck at some point specifically because I won’t eat them. I picked these up today and was pleasantly surprised. I think I actually prefer these to Flamin' Hot Cheetos - mostly because these do not have the puckery punch of the citric acid. These are a more cheese dominated with the spice giving it good heat up but not adding as much of its own flavor, whereas the FHC has more of a lime-vinegar-spicy flavor with the cheese more in the background. News: Vanilla Almond Raisin Bran Crunch is Coming Soon!